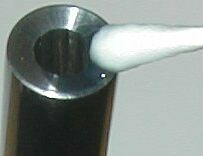 The primary purpose of a firearm muzzle crown is to provide propellant gases a	resistance free path away from all parts of the projectile as it exits the bore	of the barrel. The secondary purpose is to protect the bore from damage caused	by misuse. The third purpose is for good looks which is always achieved when	the primary purpose is satisfied. 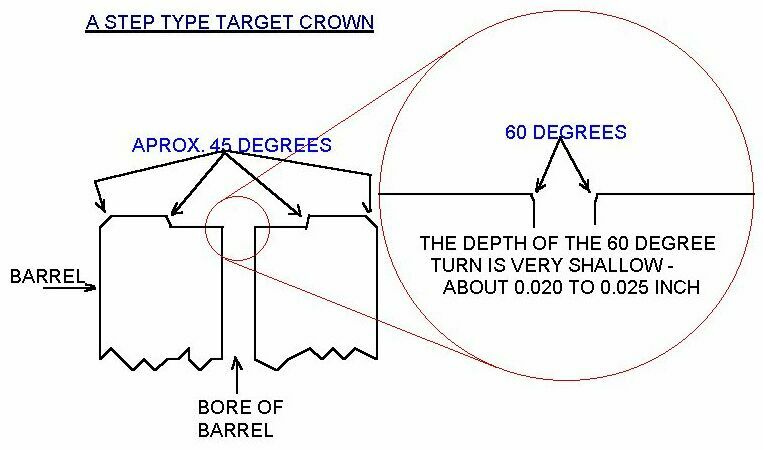 There are two basic types of target crown - the 'step' and the '11 degree'. The	muzzle of the step crown is first cut 90 degrees of barrel (square) then about	half the muzzle radius is counter sunk with the wall of the counter sink	usually at an angle of about 45 degrees. The muzzle of the 11 degree crown is	sunk at an angle of 11 degrees from square (79 degrees of barrel). The 11	degree angle extends either the full muzzle radius or the greater part of	muzzle radius. The exact angle sometimes varies a degree or two from eleven and	is still referred to as being a target crown but through experimentation and	time eleven degrees is normally accepted as the optimum universal angle for	this type of target	crown. 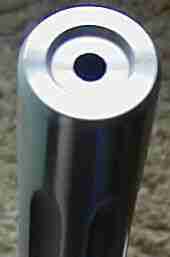 Picture shows a 'step' type target crown on a Green Mountain .22 caliber	barrel. Below is a description and procedure for making a step type target crown taught	me by Ray Dixon, who cuts target crowns on target and varmint rifle barrels as	part of his profession. Using a lathe with steady rest and cutting tool to turn and cut the work piece,	the muzzle is squared then	stepped in a few hundredths of an inch. The sharp	edge of the muzzle is turned off at a non-critical angle to help protect it	from dings. Leaving metal above the circumference of the step (the crown)	protects the crown from dings. The step is angled down at about 45 degrees to	help direct gas turbulence away from the exiting bullet. Because gases should escape with equal resistance across the entire area of the	crown, it is important that all crown surfaces be smooth and similar throughout	its area. Attention to this becomes more critical as the crown approaches the	bore. 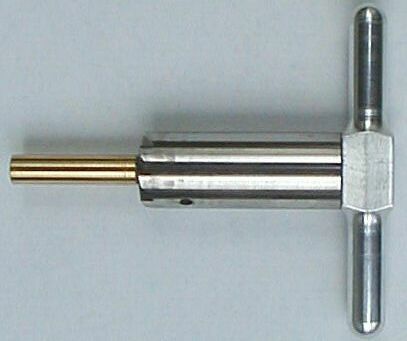 Using a 60 degree piloted bit attached to the tail stock of the lathe, the	sharp 90 degree edge of the bore exit is turned off at a 60 degree angle. The	importance of this is to protect the bore edge from gas erosion and thereby	ensure the bore exit remain smooth with no irregularities along its	circumference. Great care is taken to make this cut very smooth so that it be	alike along its entire surface. To aid in this the barrel is turned only by	hand while making very slow advances of the tail stock, which contains the	piloted bit. To help ensure the 60 degree edge be consistent in depth and bit	chatter minimized this cut is kept very shallow, only about 0.020 to 0.025 inch	in depth. The pilot of the bit is a diameter which matches that of the bore	closely enough to keep the axis of the bit aligned with that of the bore,	keeping bit chatter down and depth consistent. Should the bore exit not be consistent about its perimeter gases escaping	unevenly around the bullet base will cause bullet yaw and loss of precision. Below is detailed the tool and procedure	recently used to apply an 11 degree	target crown to the muzzle of a	Ruger	model Number 1B, caliber Springfield 30-06. 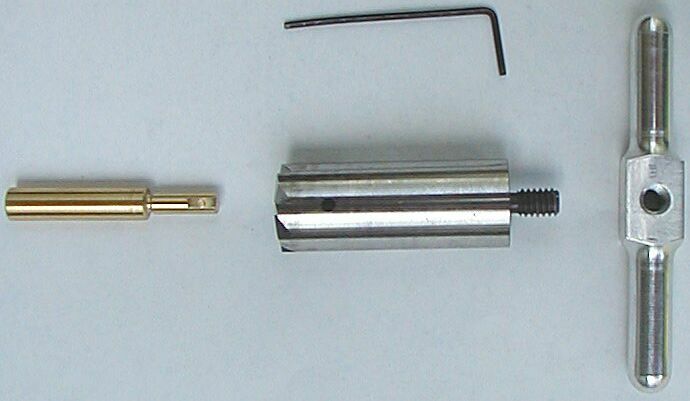 Left - .308 caliber brass pilot, 79 degree muzzle crowning cutter, cutter handle	and allen wrench for tightening pilot to cutter. Center - the assembled tool used for cutting the 11 degree target crown. Right - the business end of the tool. All parts of tool were purchased from	Brownells	. The hex wrench did not come with the tool. The 79 degree cutter is found through their web site index under	'CROWNING/BARREL' or 'CHAMFERING/BARREL'. The handle for cutter and the pilot are both found under 'CHAMFERING/MUZZLE'. Pilots are advertised for most calibers and are available in steel or brass. Brass was chosen because it is softer than the rifling lands. Two sizes of cutter are advertised: 1/2 inch diameter and 3/4 inch diameter for	small and larger barrel diameters. The cutter used here is the 3/4 inch	version which works for small and larger diameter barrels. 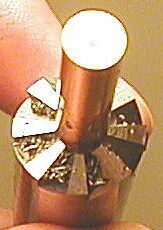 Note that using	this cutter, crowning a 1 inch diameter barrel would leave a minimum of 1/8	inch radius uncut but none-the-less would yield a proper functioning 11 degree	target crown. The original factory crown just before cutting it to an 11 degree target crown. Honing oil is applied to cutter and muzzle before any cutting is performed. It	is also wise to apply oil to pilot to reduce possible friction to rifling lands. Periodically cutting stops to clean metal shavings from muzzle, bore and tool. Honing oil is re-applied before cutting continues. The oil used here is honing	oil sold for knife sharpening. 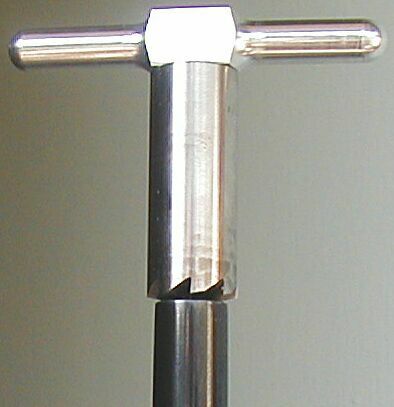 Left - crowning cutter with pilot inside bore, ready to start cutting. Center - beginning of target crown after only 10 or 12 light 1/2 rotations of	cutter. Care is taken to keep	light and consistent	downward hand pressure centered on bore so pilot does not wobble. Cutting is	performed slowly and can be stopped and resumed at will but it is important to	keep cutting surfaces coated with the oil and to clean metal shavings from	bore, muzzle and cutter before re-inserting pilot. Right - to keep shavings from getting between cutter face and muzzle care is	taken cutter never leaves the surface of muzzle while cutting is being	performed. Cutting is often stopped to clean shavings from muzzle, bore and	tool and to check depth of cut. As cutting goes deeper into muzzle cutting slows because more muzzle face is	contacting cutter surface. Cutting is often stopped to check for depth and to	clean away shavings. 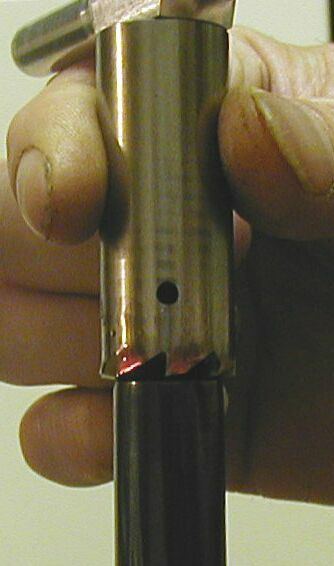 The muzzle becomes very sharp where it enters the bore	and ruff cutting is stopped just short of maximum barrel radius. Shown above	the ruff muzzle is ready for finish cutting after about eight careful cutting	sessions. Left - finish cutting is performed with increasingly lighter pressure as cutting	progresses until almost only the weight of tool is applied to the muzzle. Center - crown after finish cutting. 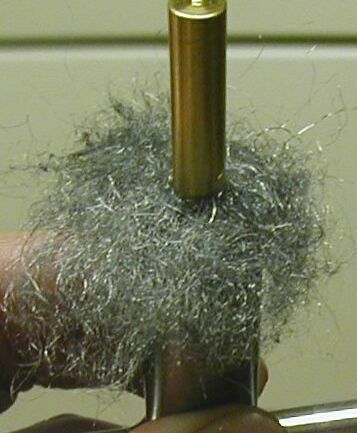 Right - a thin and even amount of 00 steel wool is placed on cutter face and	used to	lightly	burnish any microscopic burrs off muzzle crown. Care is taken	to flatten the wool against the cutter face before inserting pilot into bore	and it is important not to over burnish using this method because any steel	fibers accidentally allowed into bore could score rifling lands. Left - after using alcohol to degrease the muzzle OXPHO-BLUE from Brownells is	used to cold blue the muzzle. Right - Three coats of blueing agent was applied to muzzle. After each	application the muzzle was wiped with dry towel and	lightly	polished using 0000 steel wool.